StorPool Performance Test: 3x NVMe storage servers - 0.06 ms latency! 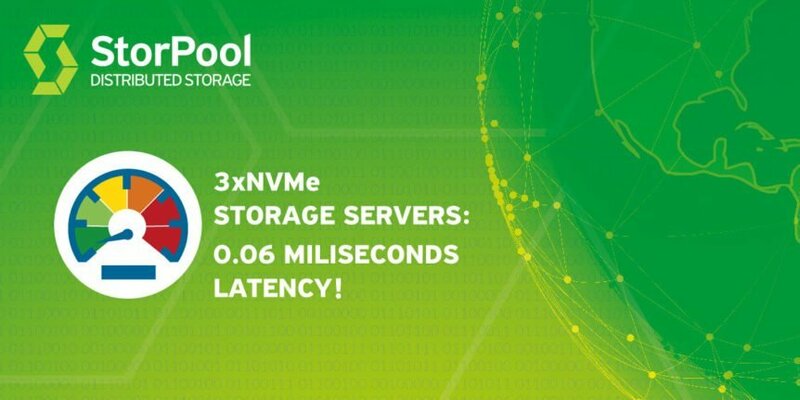 StorPool Storage Performance Test: 3x NVMe storage servers – 0.06 ms latency! One of the main capabilities, for which StorPool is recognized globally is the ability to deliver unmatched storage performance. Even at a small scale it delivers astonishing performance, while scaling linearly as the storage system grows. The blazing fast storage speed, at affordable price makes StorPool a preferred choice for companies, aiming to achieve great performance and high availability at an affordable price point. Even a small StorPool setup can replace a multi-million dollar all-flash storage array. To demonstrate what StorPool is capable of we post the performance metrics of our latest small, NVMe-powered demo lab. 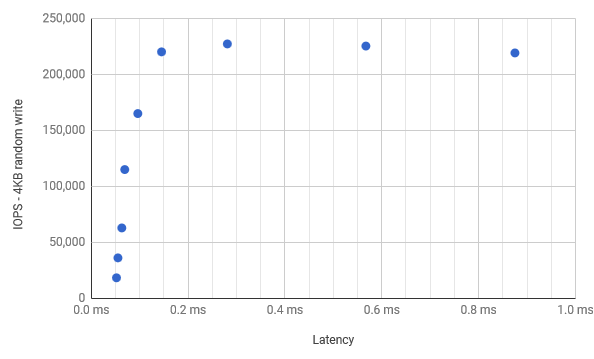 We measure performance in IOPS and latency, and also show the correlation between these two metrics, as visible from an individual initiator. Low latency is one of the most important metrics for a storage system (and not IOPS alone). This is so, because real production workloads are typically with low queue depth, i.e. 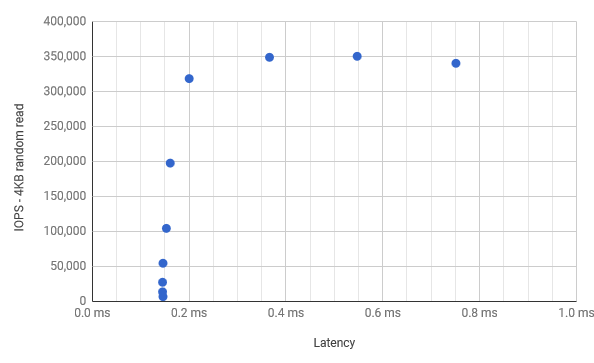 latency sensitive, while also experience occasional bursts (lots of operations submitted at the same time). Therefore, for the real workload, both latency under light load and burst handling capability are important. The storage system under test consists of 3 storage nodes, which are with NVMe SSDs. Total capacity: 12 TB raw = 3.6 TB usable (with 3-way replication, and 10% for CoW (Copy on Write) on-disk format and safety checksums). Note: the hardware used here is optimized for a small lab setup. Production systems usually have more and much bigger NVMe drives, in order to improve density and optimize $/IOPS and $/GB. Some tests are limited by the number of initiators and CPU resources allocated for workload, initiators and storage software, as the storage sub-system was not designed for running applications. The same system would be able to deliver more throughput to a larger number of external compute servers/workloads. Test designed to show relation between storage performance latency and IOPS of the storage system, as visible from an individual initiator. The presented storage system is recommended for public and private cloud builders, who are searching robust shared storage system, with the best price/performance in terms of latency and IOPS.